We recently hired Dovely Moments for my nieces remembrance ceremony. My experience in working with Miss Roberta was wonderful. She is such an amazing person to work with and her attention to detail is impeccable. Her doves, especially the one she chose for our ceremony was truly divine. It was patient and well manored. I thought I would be more nervous but once I held the dove, it cradled my hand patiently waiting until it was time to release. Our dove, once released, did not fly away immediately but instead perched itself on the tree and watched the entire ceremony. Once the ceremony was over it flew away. What a dive moment that made the occasion that much more memorable! 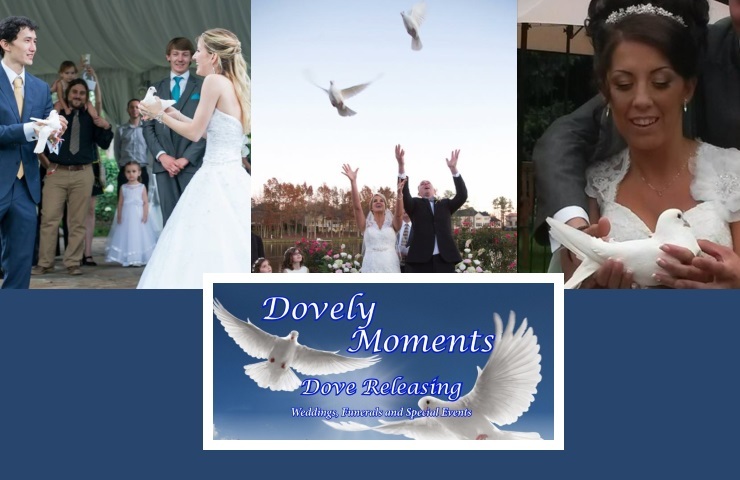 I would highly recommend Dovely Moments for your special occasion and I hope your dove brings a special touch to your ceremony as ours did. We used Dovely Moments at the end of the burial of our daughter. It was a wonderful experience adding something special and memorable to such a difficult time. Our daughter's youngest son released the 11 doves and my husband released the single dove. It was priceless and so comforting. Roberta was awesome to work with, a real angel. Thank you so much for everything. Dovely Moments was an amazing experience and the highlight of the day. Roberta and her doves are just beautiful and calm as can be. Trying to figure out when I can use Dovely Moments again to give a unique touch to any occasion. Just might have to be at our yearly Christmas party - the kids would be so excited. If I could give 10 stars I would - the send off was just WOW and truly a lasting memory. Awsome experience! Well worth it! A dove release at the end of the service, simple, elegant, and thoughtful. Highly recommend.